Summer snacking doesn’t get any easier than prosciutto wrapped peaches. You know, I have a lot of complaints about my local grocery store’s produce department. Bagged lettuce from it never lasts more than a day, tomatoes are bruised and often visibly rotten or moldy, and they are frequently dead out of such exotic things like … oranges, avocados, and peppers. In fact, I’m so fed up with their produce department, that I have largely abandoned it in favor of the local farmer’s markets around town ( Mt. Pleasant and Mixon being a few of my favorites ). Don’t get me wrong, I LOVE supporting local, but let’s be honest … it can be kinda a pain to split up the shopping. After a full day at the office, and a combined two hours of commuting for the day, I just want to be able to drop in somewhere on the way home and pick up my fruit and greens in the same place I buy my flour. Yeah, that’s like three fingers of bourbon, and it was DELICIOUS with the peaches. However, the other day I was blowing through the produce department on my way to the checkout lane, and for once, I smelled the intoxicating scent of perfectly ripe, fresh peaches. It stopped me dead in my tracks. Sure enough, the ever-failing corporate produce department had a huge display of fresh, South Carolina peaches. By the way, in case you didn’t know, South Carolina is second most producer of peaches in the country! I had to grab a few. Okay, ten. I grabbed TEN peaches. Then I got home and realized … what am I going to do with TEN peaches?! I set aside three to eat plain ( Attention everyone in my office: I’m really sorry about that meeting where I thought I could eat a peach neatly but instead ended up looking like a toddler trying to eat pudding with my hands, covered in juice and bits of peach on my face. ) I set aside another three to make a peach cobbler, which failed miserably. I ate a peach while I thought about what to do with all of the peaches. 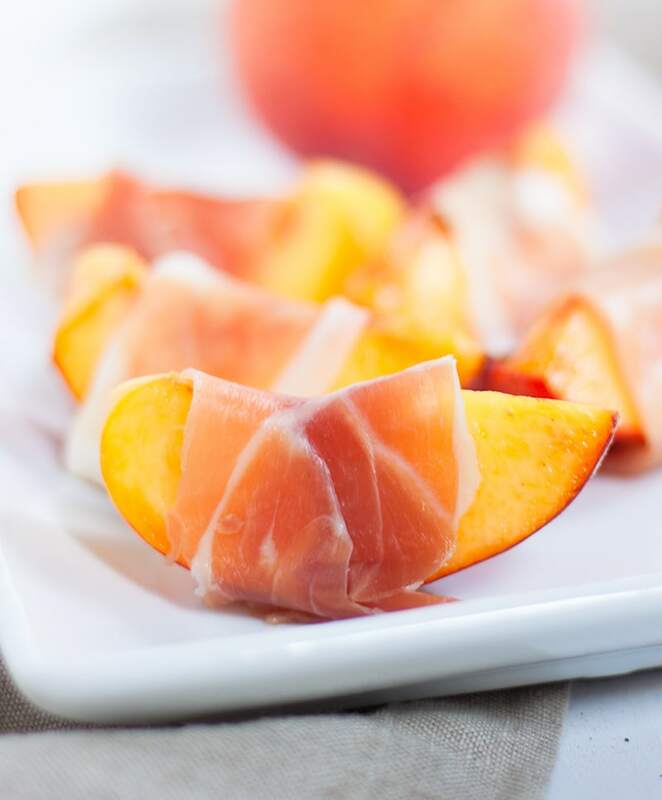 With only three unallocated peaches left staring me in the face, I thought back to a recent post I’d read over at Coastal Kelder that reminded me of one of my favorite treats: Prosciutto Wrapped Melon. For some reason this picture only has two fingers of bourbon in the glass. That’s weird. I wonder what happened? Why not make Prosciutto Wrapped Melon…. with peaches?! Well folks, that’s exactly what I did! 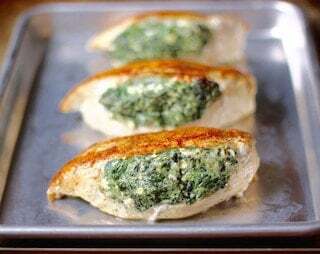 Easy, no-bake, two ingredient summer entertaining recipe. Cut each peach in half, remove the pit. Cut each half in thirds, so that one peach yields 6 slices. Cut each slice of prosciutto in half ( I've done it by length and by width, and I prefer by width, but it doesn't really matter). 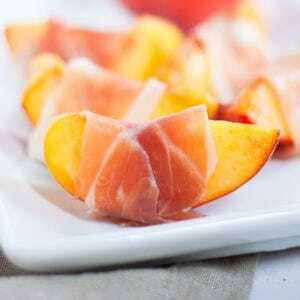 Wrap a half slice of prosciutto around a peach slice. Press the end of prosciutto slice to the part of the slice that's wrapped around the peach already to seal. Repeat for each peach slice. 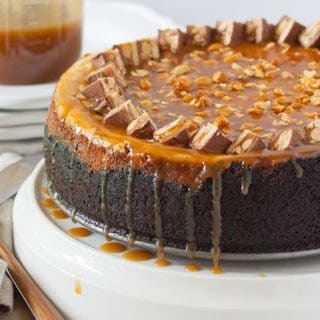 so different – and so scrumptious! 1. You’re the best — thanks for the love! 2. How have I never thought of wrapping prosciutto around peaches before?? Like duh it’d be great! Will have to do this immediately.